Peter David Schiff is an American businessman, investor, investment broker, financial commentator, financial analyst, radio personality, and author. He was born in New Haven, Connecticut, on March 23, 1963, to a middle-class family and his father was the son of Jewish immigrants from Poland. After serving in the U.S. Army in World War II, his father became a vocal proponent in the U.S. taxpayer protest movement and ultimately died in prison while serving a thirteen year sentence for tax evasion. His parents divorced when Peter was young, so he moved around the country with his mother and brother, from Connecticut to Manhattan to Florida, ending up in Beverly Hills, where he attended Beverly Hills High School and then went on to UC Berkeley, where he graduated in 1987, with Bachelor of Science degrees in both finance and accounting. Schiff began his career as a stockbroker at Shearson Lehman Brothers in the early 1990’s. He and a partner acquired an inactive brokerage firm in 1996. They renamed it Euro Pacific Capital and began brokerage operations from a small office in Los Angeles, California. Today he is CEO and Chief Global Strategist for Euro Pacific Capital, now based in Westport, Connecticut, with satellite offices in Boca Raton, Newport Beach, Scottsdale, Los Angeles, and New York City. The firm specializes in non-US markets and securities. He is founder and chairman of Euro Pacific Bank LTD., an offshore bank based in St. Vincent and the Grenadines, Euro Pacific Asset Management, LLC, an asset management company founded in Newport Beach, but moved to San Juan, Puerto Rico, in 2013, and SchiffGold, a precious metals dealer based in Manhattan. In addition, he is founder of Euro Pacific Canada Inc., a global brokerage firm, with Canadian registration, utilizing headquarters in Toronto, with offices in Burlington, Montreal, Tokyo, and Vancouver. Schiff credits his father for his deep understanding and strong support for the Austrian School of economic thought, which is based on methodological individualism, the concept that social phenomena result from the motivations and actions of individuals. Its rejection of econometrics and aggregate macroeconomic analysis landed it far outside mainstream economic thought for many years. That is, until Friedrich Hayek, one of its staunchest supporters, shared in the 1974 Nobel Memorial Prize in Economic Sciences. Schiff has a history of disagreement with American economic & monetary policies and has been quite vocal about it for many years through a variety of forums including; TV financial analyst & commentator, his own radio show, and podcast shows on market activity. He supports the Republican platform, was an economic adviser to Ron Paul’s 2008 presidential campaign, and ran an unsuccessful campaign himself, for a U. S. Senate seat in Connecticut, in 2010. Preceding the 2007-2008 economic collapse, Schiff appeared prolifically on business news programs and warned of the potential for a collapse. So animated and profuse was his presentation, that the media essentially labeled him “Dr. Doom.” Once vindicated by the collapse, he continued to hound the media to make people aware of the dangers of a runaway national debt, uncontrolled Fed printing press, and the potential it created for hyperinflation. He is the author of six books espousing his economic beliefs, one of which, Crash Proof: How to Profit from the Coming Economic Collapse, published in 2007, achieved both the Wall Street Journal & New York Times bestseller lists. In spite of his success, he has many critics who point to many claims he’s made that “simply haven’t happened.” For example, in December of 2007, Schiff called consumer credit “a cancer on the free market economy.” He predicted that the coming economic crisis would extend to the credit card industry and there would be a “blow up of credit card finance.” A prediction that hasn’t yet come to fruition, but it’s plain to see that the reason is the artificial support provided by the Fed, in the form of absurdly low interest rates, which have permitted the credit card companies to eat a large and growing number of losses, simply based on the astronomical margins provided by their ongoing abuse of consumer credit rates and fees. Schiff is a well-known proponent of physical precious metal ownership, particularly gold and predicted values to exceed $5,000 per ounce back in 2010. While the prediction has yet to be achieved, again there is a direct connection between the Fed’s constant castigation of gold, particularly while they clandestinely were acquiring it and the absurdly low interest rates they’ve supported, which was touted to be made available to public companies in order to “stimulate the economy” by promoting investment in maintenance, infrastructure, and growth opportunities. But since 2008, the reality is that public companies have borrowed $1.9 trillion of the cheap Fed money and invested $2.1 trillion into company stock buyback programs. The buyback programs inflate stock prices, fatten executive bonuses and give shareholders a thrill, but essentially leave the company bare-naked and incapable of taking advantage of a growth opportunity if it presented itself. Again, it supports the facade that the market is growing and economy is moving, but it is strictly a facade when you look behind the curtain. The “hot stock market” facade, has not only postponed the inevitable, but possibly placed the market into a position of needing not only a serious correction, but potentially a cataclysmic collapse. Schiff has been a major supporter of Ron Paul and shares many of his concerns with regard to the current course of American economic and monetary policy. In his Crash Proof bestseller, Schiff stated that U.S. economic policies are fundamentally unsound. With the benefit of hindsight and watching the national debt practically double over the last ten years, it seems that few would attempt to offer a point of contention. Further, it appears that the national debt could be approaching $25 trillion by the end of the current administration’s current term. Schiff favors increased personal savings and production to stimulate economic growth and has regularly voiced opposition to the Fed’s unilateral freedom with the fiat money printing press. Whenever possible, he expresses his belief that today’s artificially low interest rates are facilitating, supporting, and even encouraging today’s low personal savings rate, then he goes on to remind everyone of the transformation that occurred as the national debt began to swell. He points out that America went from being the world’s largest creditor nation during the 1970’s to the largest debtor nation by 2000 and the trend is showing no signs of change. Bitcoin has raised the ire of banks and governments alike, because it strikes at the heart of their ability to manipulate, control, and charge for their monopolized services. And as much as Schiff may enjoy irking those two establishments, he is not a fan or even supporter of the cryptocurrency, on the grounds that it is merely a service and payment method, rather than a currency which retains value. Schiff sees the Fed’s actions, past and present, as an exercise in futility that will continue to depress the value of the dollar. He supports a national sales tax in lieu of personal and corporate income taxes, or a flat tax that would eliminate “deductions,” particularly the home mortgage deduction, which he sees as a black eye to renters. Schiff has been and continues to be an avid supporter of physical precious metals, particularly gold, as the best protection for investors against the ravages of inflation, market panic, and economic uncertainty. It is a store of value, as well as a universal money. It is far more correct and useful to consider it insurance, than an investment, regardless of popular beliefs. He saw to it that Euro Pacific Bank Ltd., his off shore bank, began offering 100% physically backed gold and silver accounts integrated with the global debit card system in 2011. Critics of Schiff regularly blast him for the fact that inflation has not roared in as he predicted. Schiff’s reply is that it is due to government manipulation. Critics disagree, but the government’s bold face lies are apparent to anyone willing to examine the facts. For example, Fed Chair Yellen recently reported that banks are “safer than ever” and there is no longer a danger of “too big to fail.” Considering that banks today have exponentially greater liability exposure through their ongoing and abusive use of derivatives, than they did during the 2008 banking crisis, the statement seems laughable. And “too big to fail” may be true in a sense, but not due to any meaningful regulation or policy changes, but rather due to the fine tuning of the “bail in” process, which allows banks to shift the liability from taxpayers, directly to bank depositors and shareholders. So apologies and permissions are no longer needed, they now have carte blanche to take anything they need and whenever they need it, from unsuspecting depositors and shareholders, who are “unsecured creditors” at the bottom of the banking food chain. Peter Schiff on Quantitative Easing highlights many of the bullet points that we’ve been espousing for years. Peter effectively describes QE1, which occurred between the 2008 financial crisis and November of 2010, as an attempt to make cheap money available for the purpose of stimulating the economy. He reports that it didn’t work, but we believe it’s important to point out key elements that caused it not to work, specifically for example, that without direction, public companies sought to line the pockets of executives and shareholders, rather than prepare for growth and sustained company profitability, as “suggested” by the Fed. Since making the cheap Fed money available, public companies have borrowed $1.9 trillion and invested $2.1 trillion in stock buyback programs, a key statistic I’d like to have seen in Peter Schiff’s article on Quantitative Easing. Peter Schiff on Quantitative Easing subpart QE2, reports that having missed QE1 targets the Fed nevertheless saw fit to generate another round of money printing, for the purpose of buying loads of Treasury bonds, thereby injecting more cash directly into the economy. This round also failed to dramatically excite the economy or reduce unemployment and was terminated in June of 2011. Rarely does Peter miss an opportunity to draw attention to the increase in gold and silver prices, in concert with Fed failures, when reading his article, Peter Schiff on Quantitative Easing. Peter Schiff on Quantitative Easing suggests that “there will be more QEs than Rocky movies.” But we find that hard to believe in light of more than 20 years of monetary policy failures on the part of the Fed. At some point, we believe the Executive Branch needs to step in and hold the Fed’s feet to the fire. Perhaps the long list of Fed Chairpersons, mostly Ivy League “Experts” have had tremendous success displaying brilliance in the sterile confines of an economic petri dish, but in the real world, they’re 0 for a million. Peter Schiff on Quantitative Easing agrees. Peter Schiff on Quantitative Easing reports a gut-wrenching reality with regard to Fed “easing” actions, but he also includes a “famous” but less than 7-minute long You Tube video called “Quantitative Easing Explained,” that is equally (even brutally) on point, yet in an enjoyable and lighthearted presentation. It is however, very accurate, very easy to understand, and very appropriate for anyone interested in a plethora of gruesome details related to the topic. 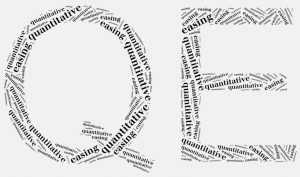 Peter Schiff on Quantitative Tightening (QT) took the form of a podcast on June 22, 2017. Peter discussed some of the problems generated by the various renditions of Quantitative Easing (QE) and indicated that the Fed might be considering QT, which was confirmed when the Fed announced plans to begin reducing their $4.5 trillion balance sheet and all this is in the face of continually missed targets for the QE program. Easing targets have been missed and missed badly in most cases. The only area showing any chance of achievement and continuance is unemployment, but success in that department has not contributed to success in others, inflation being the most prominent. Nevertheless, “Yellen came out swinging,” said Peter Schiff on Quantitative Tightening. 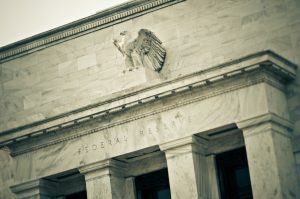 Peter Schiff on Quantitative Tightening reported on the Fed balance sheet, which consists of Treasury and mortgage-backed bonds amassed during the initial phases of QE, such that the Fed injected liquidity into the financial markets, by purchasing at a rate sometimes exceeding $80 billion per month. The result was lower long term interest rates, increased bond and real estate prices, and rally cash/enthusiasm for a stock market, with a depraved basis of economic fundamentals. The QT plan calls for reduction of the holdings, initially at a rate of $10 billion per month, increasing to $50 billion per month over time. Those are very big numbers, destined to provide serious headwinds to the economy and financial markets, reported Peter Schiff on Quantitative Tightening. It’s critical to realize, said Peter Schiff on Quantitative Tightening, that the CBO estimates Federal budget gaps to be in the $700-$800 billion range annually (hitting $1 trillion by 2010 or 2021). And this Fed “plan” does not factor in spending increases, potential tax cuts, or recessions (though Peter feels all three could become prominent). Every percentage point rise in interest rates, currently converts into approximately $200 billion more per year in debt service costs. The Fed “plan” potentially represents $1.6 trillion in borrowing per year, an unprecedented scenario that could quite possibly create even greater problems, says Peter Schiff on Quantitative Tightening. The greatest danger, says Peter Schiff on Quantitative Tightening, is the possibility that by announcing such a protracted “plan,” large holders of Treasuries, such as foreign central banks, and sovereign countries, might decide to get out in front of the Fed and start dumping their holdings before prices fall further. Peter stresses the potential danger that a Fed firmly committed to QT, could turn a bear bond market into precipitous crash very quickly. In summary to this article, call American Bullion now at (800) 653-GOLD (4653) to buy physical gold, silver, and other precious metals, so as to protect yourself and your financial legacy from the potential ravages of Fed monetary activities. Thanks to low interest rates for such a long time, consumers too have loaded up on debt, so interest rate increases will have a dramatic affect on consumer spending also, offers Peter Schiff on Quantitative Tightening. Peter Schiff on austerity requires observers to understand the difference between austerity and fake austerity. Fake austerity allows government to mandate rules and policies that increase the retirement age, restructure labor classes, and make employees work longer hours, so they can point to it and say, “Look what we’ve done.” But it’s unrealistic to implement such policies and walk away. 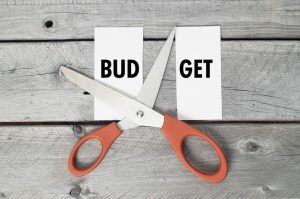 True austerity is a system of deep and organized cuts, combined with obvious benefits that encourage the workforce to participate and appreciate the required changes for the ultimate goal of economic recovery. Critics of Schiff say that citizens of Greece are protesting, due to unrealistic benefit cuts related to implementation of the new austerity program. “It’s good that they’re protesting.” That’s a clear indication that true change is occurring, says Peter Schiff on austerity. Peter Schiff on austerity continues by saying, Greece was broke even before the 2008 global meltdown and people feeding off the public trough are protesting, that’s great! “I wish the same protests were occurring in the US…protest and take action now or we’re going to pay in the future when the dollar collapses.” True austerity requires that we shrink government, provide for a sound currency, and permit the market to control interest rates, not the government. This “true” austerity mentality is not represented by the abusive version being utilized by the European Union. Worse yet, they are trying to simultaneously implement the same stupid stimulus techniques that the US has proven, time and again, don’t work. Europe’s misguided combination of stimulus and spending cuts are only serving to inhibit employment and savings, says Peter Schiff on austerity. The question people need to be asking, says Peter Schiff on austerity, is where else is the money going to come from. Economies are slow, unemployment in most countries is higher than it should be, and cuts are quite frankly as high as they need to be, none of which supports economic growth. Increased taxation on the common worker can’t be the answer and printing money isn’t the answer, so where is this required operating capital to be found? Protest all you like, but the answer is in true reform that shrinks government, supports global currencies, and allows the market, not the government, to dictate interest rates. 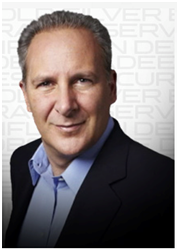 Only then is there an opportunity for recovery, says Peter Schiff on austerity. Peter Schiff on austerity also suggests that gold is one of the best forms of individual savings instruments. The government imposed difficulty generating savings in most countries today, practically mandates the utilization of gold as a store of value, opportunity for appreciation, and hedge against potential economic disaster, in nearly any form. An appropriate combination of austerity and employment stimulus is what’s called for in practically every country today. A truly free market needs to be supported and government intervention and manipulation needs to be severely curtailed, says Peter Schiff on austerity. 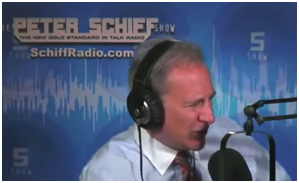 Peter Schiff debates Krugman and the gloves came off. Paul Krugman is a Princeton professor, author, Kenesian theory advocate, big government supporter, feels that gold is a barbaric relic only of interest to the wealthy as a plaything, and winner of the 2008 Nobel Prize for Economics related to his theoretical breakthrough on analysis of international trade patterns. Peter Schiff is CEO of Europacific Capital, a proponent of tiny government, interested in killing many public departments and programs, including social security which he considers the world’s greatest Ponzi scheme, an avid proponent of physical gold ownership, who predicted the 2008 housing bubble well in advance and in great detail. A greater difference of views would be hard to find when Peter Schiff debates Krugman. Peter Schiff debates Krugman beginning with the topic of government’s role in the economy. Schiff believes that the less government involvement, the better, because we should let a free market direct its own course. Krugman disagrees, suggesting that the government is the only player capable of borrowing, spending and getting the economy moving again. Once achieved, the throttle can then be pulled back, as quickly as possible, so long as it’s done without losing momentum. Schiff blames the Great Depression on government manipulation and mismanagement, while Krugman credits it directly to a free market economy run amok. Both sides firmly insist that theirs is the only and obvious correct analysis, when Peter Schiff debates Krugman. Things get even more heated when Peter Schiff debates Krugman on the topic of Fed monetary activities. Krugman feels that it is the Fed’s job is to manipulate the economy in such a way so as to ensure that depressions don’t happen and if they do, that it’s only for a short period of time. Schiff sees government involvement as an albatross on the back of the American taxpayer. More government costs more money. He feels the solution lies in cutting government spending to the bone, otherwise we have to increase taxes on the middle class. Today’s huge Fed deficit results in inflation, which monetizes the debt, levying just another “tax,” particularly on the middle class. So ends another round when Peter Schiff debates Krugman. When Peter Schiff debates Krugman on the topic of gold, Krugman says that he agrees with Keynes, that gold is a “barbarous relic,” suggesting that it has lost its value in today’s world. Schiff quickly points out that gold still has the universal value it’s been assigned for millennium, but more than ever has high demand in applications ranging from medical and dentistry, to cell phones and emerging technologies ad nauseam. He also points out that Keynes reference was not to “gold,” but to the gold standard and more specifically the relative rates of exchange that caused United Kingdom such consternation in the aftermath of WWI. Gold wins when Peter Schiff debates Krugman.